The online forum Cultural Fluency (culturalfluency.info) is a series of conversations, exhibitions, and events which examine the creative exchange between urbanism and art practice. By regularly including new interviews and inviting the public to participate, the forum aims to expand the conversation across fields and globally. 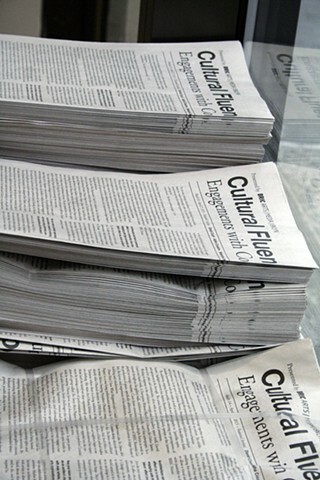 The first edition of Cultural Fluency took the form of a limited edition newspaper, accompanying the exhibition at BRIC Rotunda Gallery, Cultural Fluency: Engagements with Contemporary Brooklyn. The exhibition showcased the work of David Court, Aisha Cousins, Malesha Jessie, Hiroki Kobayashi, Martin McCormack, and Mark Reigelman. 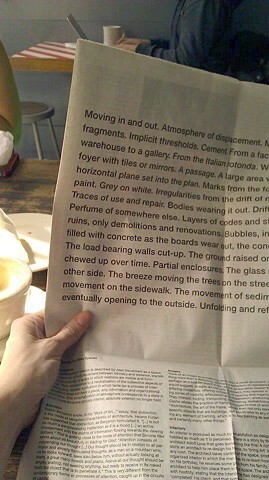 The last page of the newspaper features Court's text-based artwork, which extended throughout the space as well as the exhibition's marketing materials. The first edition includes interviews with the artists in the exhibition as well as New York City Council woman and MoCADA founder Laurie Cumbo, artist and Minus Space founder Matthew Deleget, cultural producer and World Economic Forum Global Leadership Fellow Karen Demavivas, Keith Gill of FREECANDY, architect Thomas Leeser of Leeser Architecture, The Guardian and Feministing columnist Syreeta McFadden, and artist and FiveMyles founder Hanne Tierney. During their interviews, they discuss the relationships between politics, community, architecture, poetry, and performance with their art and with the city.